Our society continues to prefer denial over all aspects of raising domesticated animal. The harsh truth is that acceptance of nurture makes you the individual equally responsible for how the animal lives and yes how it dies. At the same time, eating meat is accepting the gift of that nurture and your gift to the support of land husbandry. A viable horse meat market would establish demand for horse meat that would provide a base level of support for the many breeds that we are struggling to sustain. It is not going to happen of course as everyone prefers their version of denial. (NaturalNews) The next burger you bite into might be a horsemeat burger, thanks to the U.S. government approving horse slaughterhouses to produce meat for human consumption. Valley Meat Co in Roswell, New Mexico, is being green-lighted by the USDA, which will routinely send inspectors to make sure it is slaughtering horses and processing horse meat in a "clean" way. Additional horse meat plants are expected to be approved by the USDA in Missouri and Iowa. While horse meat can't legally be sold in the USA for human consumption, it can be used in pet food. It may also turn up in the U.S. food supply despite its legal status because it can be sold to Mexico for human consumption, then re-labeled and shipped back into the USA for use as a low-cost meat filler. Horse meat has already been identified in a scandalous food operation in Europe, where meatballs sold throughout European grocery stores were found to be made with horse meat. 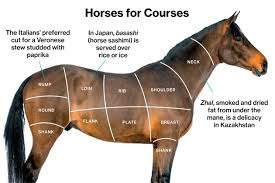 Horse meat slaughterhouses were banned during the Bush administration, but under President Obama, the ban expired (in 2011), allowing horse meat slaughterhouses to restart operations. Obama says he wants Congress to ban horse meat slaughterhouses in the USA, but then again, Obama says a lot of things he doesn't actually intend to make a reality (closing of Guantanamo, labeling GMOs, making health care free, reducing the budget deficit, etc.). The USDA says, "it was required by law to issue the grant of inspection because Valley Meat met all federal requirements," reports Reuters, which also says that 130,000 horses are slaughtered each year in Canada and Mexico. U.S. companies want a piece of that business, it seems, because horses can be acquired for virtually free. So here's the scary part of this article for those who might be a little squeamish: Most of this horse meat comes from horse owners who decide to have their horses killed for a variety of reasons: illness, injury, or simply economic reasons such as not affording to keep them fed and cared for. Instead of having the courage to give their own horse a dignified death -- i.e. having the vet administer a lethal injection, saying a prayer and burying it on the land it enjoyed -- many owners call the slaughterhouse to have the horse hauled away and subjected to a terrifying, gruesome death in a meat packing plant, surrounded by other screaming horses who are in the process of being murdered. Horse slaughterhouses are therefore able to purchase these horses for a dollar amount that's far below the actual cost to raise a horse. The horses are transported to the slaughterhouse facility (which is actually the largest cost of the entire thing due to fuel prices) and then their throats are slit to begin the "processing" of the meat. Yep, Becky's little pony that she grew up with as a teenage girl ends up bleeding out on the floor of a horse slaughterhouse in New Mexico. When expensive family pets are no longer needed, they're just sold off for meat. Keep that in mind if you're considering buying a horse for your teen daughter or granddaughter. What will happen to that horse once your daughter loses interest in raising horses after discovering that raising a horse requires a tremendous amount of physical labor? If you're a horse owner, be a responsible one. Don't let your horse get slaughtered for food. Because if you do, you not only cause your horse to experience a terrifying ending; you also may end up eating your horse the next time you whip up some spaghetti and meatballs.